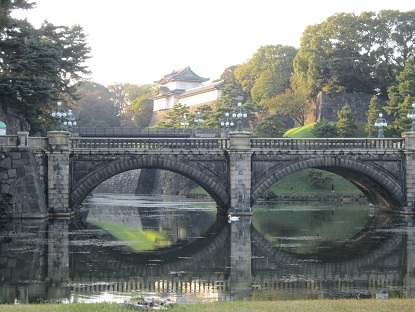 Once the center of Edo Castle and home to the shogun, the Imperial Palace lies at the heart of Tokyo and perhaps of all Japan. The emperor’s moat-lined residence may also be the most expensive plot of land on earth. The emperor’s dwelling itself cannot be seen, leaving the most memorable image that of the stony moat with its gliding swans. Yet one popular structure is Niju(_)bashi bridge, not far from Sakurada-mon Station. This is can only be viewed from a distance, except on Dec.23rd―the emperor’s birthday―and again on January 2nd, when crowds of well-wishers swarm across Nijubashi to hear a short address from the emperor. From a landmark standpoint, there is not much visually striking inside. The highlight is the imperial family itself, which on those days stands side by side with the emperor to greet the flag-waving crowds.